How to download the digital edition of What Hi-Fi? Sound and Vision | What Hi-Fi? At last! 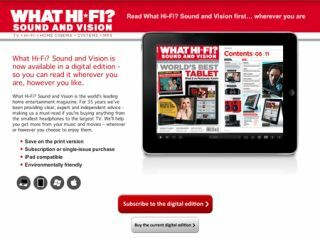 Today sees the launch of the digital edition of What Hi-Fi? Sound and Vision. After almost 35 years as a printed magazine, we are now also available to read on your PC, Mac, or iPad (Android support imminent) – wherever you are in the world. With easy to use, helpful features – such as active website links, quick navigation, simple zoom/scroll – you're getting more than just an online copy of each issue. And here's how to get hold of it. You'll need to download Zinio's digital magazine reader – either online on your PC or Mac or by downloading the free Zinio App. Some new Android devices come preloaded with the Zinio App, which will soon be more widely available. You can then buy individual magazines – or subscriptions – as/when you want (to buy a single issue, simply click on the 'buy the current edition' link on this page). Each digital edition costs a basic £2.99 (plus VAT/sales tax), or just £29.30 for a 13-issue subscription. No wait for your issue! The issues will go live on Zinio on the day the magazine hits UK shops – again, that means our international readers won't have to wait to enjoy each edition. Above is how our June issue's contents spread looks like in Zinio's desktop digital reader. Zoom into that spread (see below) and you'll see that each page reference in the contents is active, allowing you to jump straight to that article. Again, within tests – such as our TV Supertest – the list of tested kit at the beginning of the feature allows you to jump ahead directly to the review you most want to read. As well as offering live links within the issue, the digital edition also makes every website reference an active hyperlink – allowing you to click straight through to relevant online information. This will include links to content here on Whathifi.com via our editorial pages, but also web content mentioned on the magazine's advertising pages. We hope you enjoy our new edition – however and wherever you choose to view it. We'll be adding new subscription options and extra features in the future – please give us any feedback so we can make the experience even better.